SQL Server CLR tutorial shows how to read file properties using SQL CLR stored procedure created by using given Visual Studio CLR project code samples for database programmer and administrators. Using given SQL Server CLR stored procedure, users can pass the path of a file on the server as a parameter and get file properties like last write time, edited by user, size of the file, type of the document and its extension, etc. Let's start our tutorial with creating our new CLR project in Visual Studio. From Installed Templates select Visual Basic Class Library project template. Of course you build your CLR project with class library template using C-Sharp too. 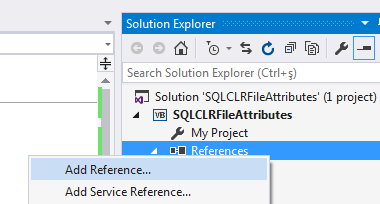 I choosed to name my SQL Server CLR project as SQLCLRFileAttributes. When our project is created, right click on project in Solution Explorer and choose Properties from context menu. Set root namespace name as I did by giving Kodyaz in this tutorial sample. Root name space will be used while registering this CLR library on SQL Server database later in our tutorial. To reach file properties on stored on the server disk files, we need helper libraries. Developers have to add these Windows libraries to the project as reference in order to use them in VB codes. Add following libraries as project reference. Click Browse button on Visual Studio Reference Manager dialog screen. Switch to COM tab Type Libraries. Scroll down until you reach Microsoft Shell Controls and Automation library. Select above assembly file and press Add button. Then click OK to close Reference Manager dialog screen. Microsoft .NET Developers are now ready to switch to code editor on Visual Studio IDE for developing CLR objects for SQL Server. Double click on the .vb class file from Solution Explorer which will display it in Code Editor view in Visual Studio. You can rename the .vb class file before you proceed further to a more suitable name. The class name is used during creation of SQL Server CLR objects in SQL Server Management Studio as we will see later. I renamed the default class file name to FileAttributes.vb in this tutorial. Please note that I added following import namespace code line in Visual Studio project file. Especially, Shell32 namespace is required to reach file properties and attributes. Here is the imports section which is placed at the top of the FileAttributes.vb code file. 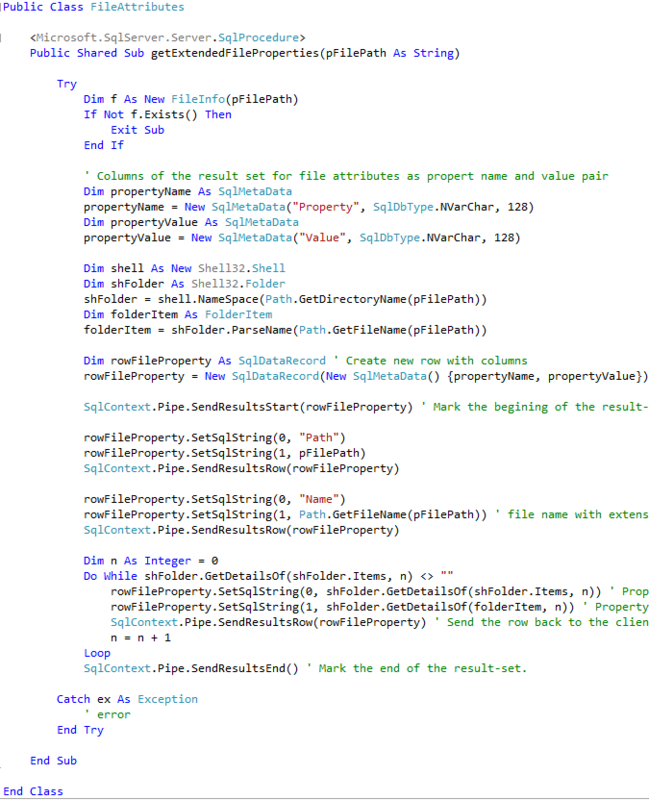 And below is the main code section used for the CLR class library for SQL Server. Here below I copy the VB.NET codes which you can use directly or by converting to C-Sharp according to your project language selection. I use FileInfo() method to validate the file path in order to check if target file exists on the server at given path. Then I create an instance of Shell32.Shell object. Using this object, I create the Folder and FolderItem objects. Because of this code blocks, registering Shell32.dll file and importing the Shell32 namespace is important. Shell32 Folder class enables us to get file properties using GetDetailsOf() method.
' Mark the begining of the result-set. Do While shFolder.GetDetailsOf(shFolder.Items, n) <> ""
' Send the row back to the client.
' Mark the end of the result-set. In Visual Studio, using top menu follow Build > Rebuild Solution for building your SQL Server SMO project. By default project will be build in debug mode. After you complete all development task, before deploying your solution to productive environmen, build it in release mode and then deploy it. After Visual Studio project is built and assembly file of the class library is created, copy the .dll file where we can use it on the SQL Server instance. As seen in below Create Assembly SQL command, the full path of the .dll file is referred while registering the SQL Server CLR library. 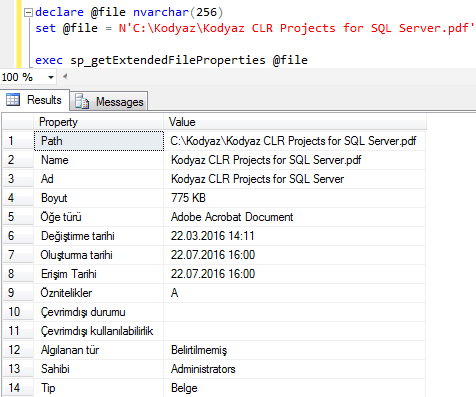 After CLR project assembly is registered on a database on SQL Server, functions and methods in the class library can be created as CLR stored procedures and CLR functions. SQLFunction Name: SQL CLR function name or sub routine name defined in Visual Studio class file. SQL developers and database administrators can use following sample code to read extended file properties about a specific file from SQL Server using CLR stored procedure. Following screenshot is displaying only a very small portion of the returned file properties using SQL Server CLR stored procedure. For example, the total number of all file properties is 289 for this SQL CLR stored procedure execution. You can download SQL Server CLR project which is ready to be opened in Visual Studio for review and improvement by using following link: SQL Server CLR Stored Procedure to read File Properties sample project. SQL Server programmers can use sample SQL Server CLR Stored Procedure Visual Studio project freely in their developments. I hope you find this SQL Server tutorial useful which features CLR stored procedure development.